I’d say, especially in the colder months, I cook at least one curry per week. They’re so fast to throw together and a great way to get plenty of vegetables in. Instead of the heavier Indian-style curries, we favour lighter, fragrant Thai curries. Thai green curry (Kaeng khiao wan) is an absolute favourite at our place. The spicier, the better! Thai red curry (Kaeng phet) is great with beef and baby new potatoes for a really hearty meal. 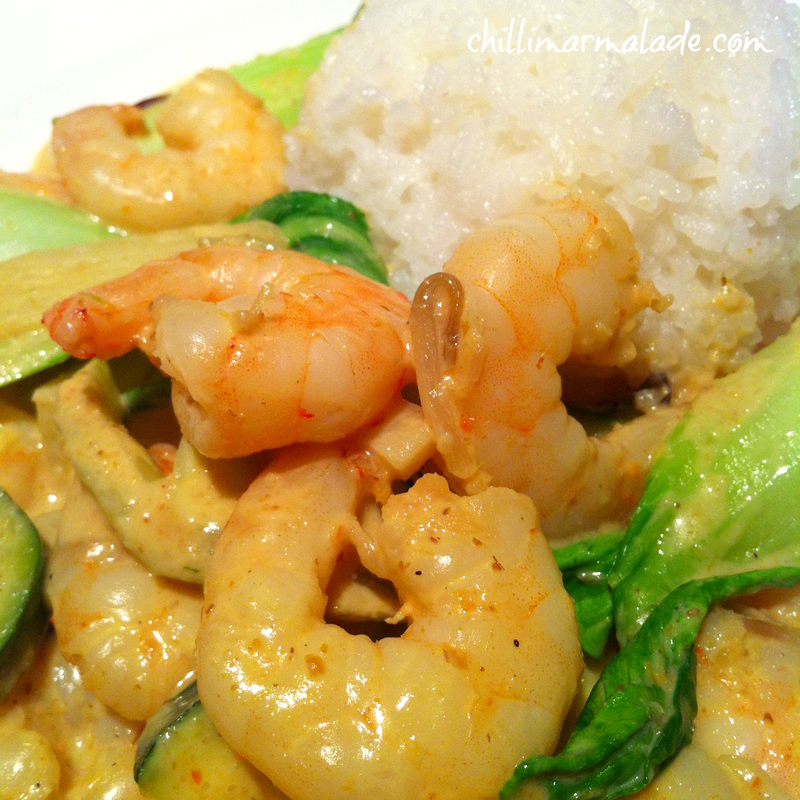 One of our new obsessions is Thai yellow curry (Kaeng kari) with prawns and pak choi – it’s a nice happy medium between the sweet spicy sharpness of the green curry, and the more mellow fiery flavour of the red curry. I have no qualms about using curry paste – yes, it’s cheating, but it’s an easy and fast way to cook. I’ve made my own curry pastes from scratch before (and in my opinion), the difference in taste isn’t huge. For everyday dinners, a ready-made paste is fine, even Nigella admits to keeping Thai curry paste nearby for easy meals. Save the spice grinder for special occasions! I always have a red curry paste, green curry paste and yellow curry paste by Mae Ploy in the fridge on standby – they keep for ages and are so full of amazing flavour. Heat the sesame oil in a large pan and add the curry paste and grated ginger. Let everything sizzle for a minute or so. Add the prawns and cook until opaque, but not entirely pink. Remove prawns from pan and put aside. Add the fish sauce to the pan, along with the chopped courgette and coconut milk and simmer until the courgette softens. Return the prawns to the pan, along with the pak choi and simmer until the prawn are pink and the pak choi is bright green and tender. The pak choi and courgette can be substituted for any greens you fancy – green beans, peas, spinach, broccoli, or a combination of all. I tend to just throw whatever I can find in, even using frozen veg if I’ve got nothing fresh to hand. As a huge curry fan I’d love to know: what’s your favourite style of curry? Do you cook with a ready-made paste, or mix your own? 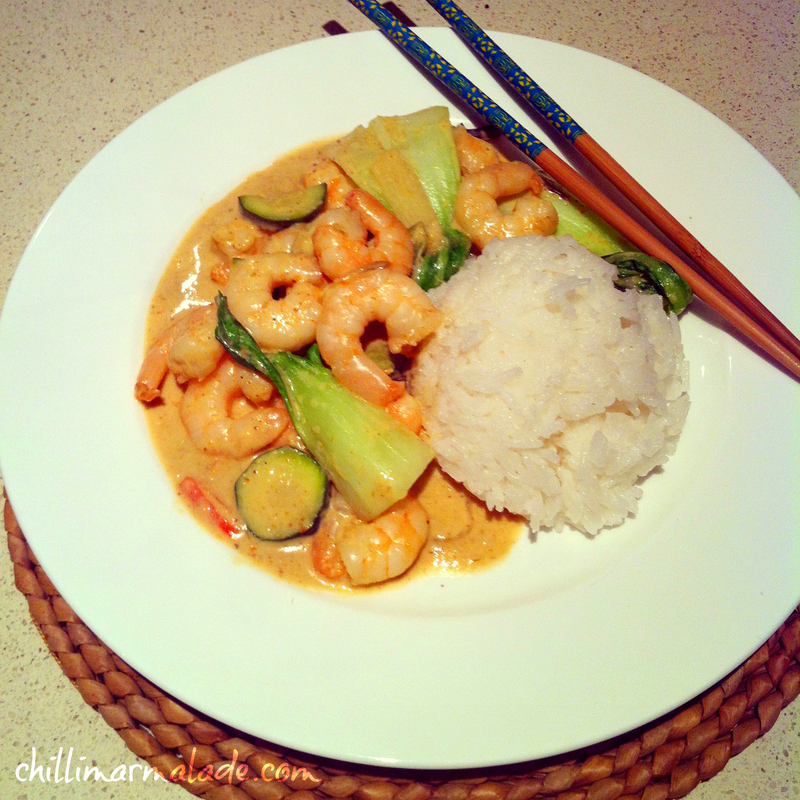 Tags: Asian food, asian ingredients, cooking, curry, food, pak choi, prawn recipe, prawns, recipe, shrimp, Thai, thai recipes, yellow curry. Bookmark the permalink. Love to eat it, but have never attempted to make it. Maybe I’ll test-drive your receipt. Nice post. That is so funny, I was just about to order the mae ploy red thai curry on amazon, but wasn’t sure if it was good! Which one do you like the best? The green curry? It’s a tough one – I like them all! But I think if I had to choose, it’d be the green curry. I haven’t made a curry in quite a while. This looks great and is starting the cravings! Great color and consistency with that curry! The shrimp also don’t look overpowered by the curry, which is always good. Haven’t had Thai Yellow curry for a long time! Yummy!! Looks lovely, I need to make another trip to the shop that has the interesting curry pastes. Looks great, and I’ve saved it to my Evernote collection. I just may try it this weekend. Thanks! I’m a huge fan of green curry and always keep the paste around. So easy to make for lots of people, too. This looks delicious! How long would you say it takes to cook this?